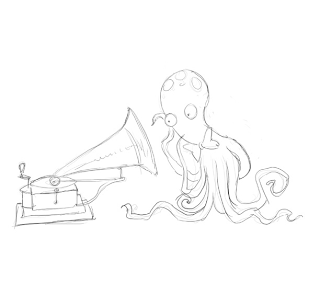 The Octopuppy: It's Quiz Time! What Happened Next? It's Quiz Time! What Happened Next? 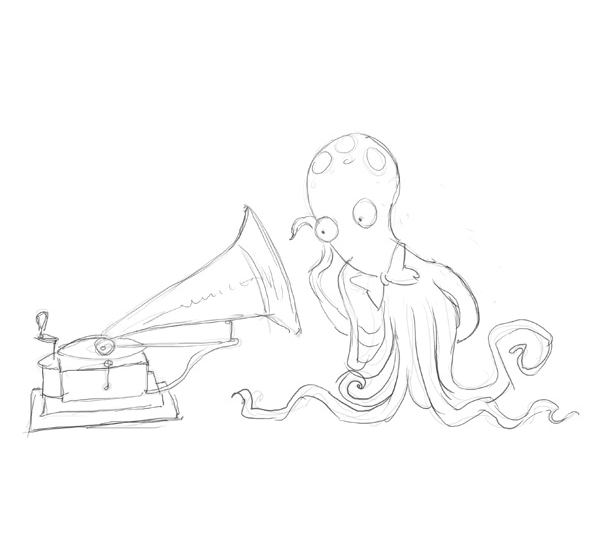 Here's one of the many little Jarvis ideas that didn't make it into the book, and remains as a rough sketch only. Can you predict in what unpredictable way Jarvis is going to react to hearing His Master's Voice? Answers on a postcard featuring a montage of the promenade and seafront flower beds of the seaside resort of your choice. You'll find out tomorrow if you've guessed right, when I'll exclusively reveal a second sketch that provides the punchline to this startling visual gag. What will Jarvis do next? No prizes for guessing what he does. That doesn't mean it's not difficult, it just means there are no prizes. Apart from the glow of profound self-satisfaction you'll feel. Don't miss out! Get your seaside postcards in quick, kids! Well done Aimee, you're very nearly right, but no it's not sausages. When will you understand IT CAN'T ALWAYS BE SAUSAGES!